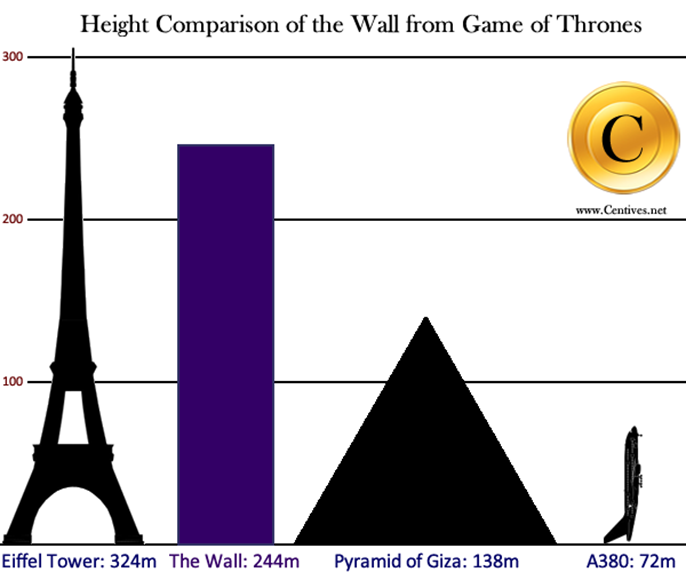 The towering wall that protects the Seven Kingdoms from mythical evils is one of the 9 Wonders Made by Man in George R.R. Martin’s World. The Knights get to the top of the wall through a pulley system powered by a person standing at the base of the wall. Centives estimates that the elevator rises at a rate of about 10cm a second and so it takes 10 seconds to rise a meter. At that rate it would take about 40 minutes to reach the top of the wall. The wall also stretches 300 miles (482 km) across. This means that it pales in comparison to the Great Wall of China which is 8,800km long, but China’s wall also twists and turns, while the Wall seen in Game of Thrones is a straight line. With the Nightswatch numbering less than a thousand during the first season of the show, this means that if evenly spread out, each Knight would be required to police a half kilometer of the wall. The wall is also wide enough for a dozen horsemen to ride abreast. A standard horse trailer is about 1.8 meters wide and so 12 horses would mean that the wall is 21.6 meters wide. With these dimensions then we can calculate the volume of the water trapped in the ice wall. The total volume of the ice is 2540332800m³ and at 0 °C ice has a density of 916.7 kg/ m³. Water has a slightly higher density and if we were to melt the wall down then we’d have 2.3 trillion liters of water. According to Wolfram Alpha this is five times the volume of water in Sydney Harbour and seven times the volume of oil transported by oil tankers worldwide in a year. Perhaps then the Stark motto “Winter is Coming” isn’t as much of a warning as it is a desperate hope. 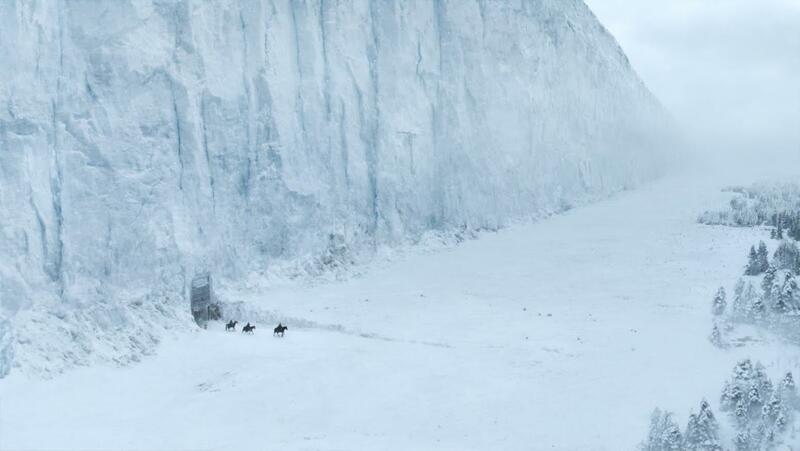 If summer were to ever come then the wall might melt and quite literally sink Winterfell. Enjoyed this article? Read the rest of our Game of Thrones coverage to find out about the value of Lannister branding or the life span of a Dire Wolf. Or take a look at our other editorials and some of our Greatest Hits. You might also want to follow us on Twitter or Facebook to get the latest and greatest from Centives. ← How Long Does a Dire Wolf Live? Newer archeological discoveries tell us, that the Great Wall of China is significantly longer than previously believed. The distance you cite is the old(?) erronous one. Newer scholarship actually states that the “Great Wall” is actually a series of smaller walls created by different societies over thousands of years. This is important to remember; unless everyone put a brick down right at the instant somebody said ‘read, set, go’, then technically, it’s not even a wall. It’s just a coincidence made out of stone components. It should be a spectacular scene in the next book, if it falls (and I think it will). It’s obviously held up by magic, anyways. I don’t think water-ice has the compressive strength to stay up in an 800-foot-tall, “seven horse width” wall shape.